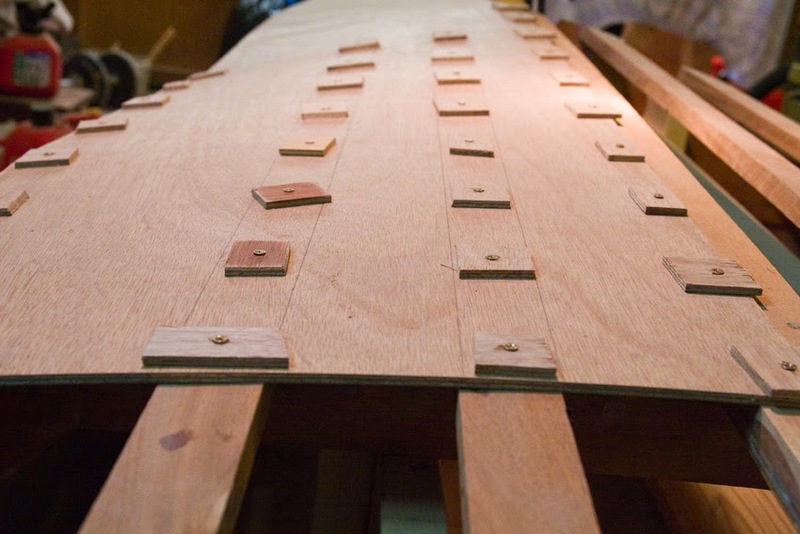 So, cautiously and methodically, I have continued fastening down the first panel for the bottom planking. 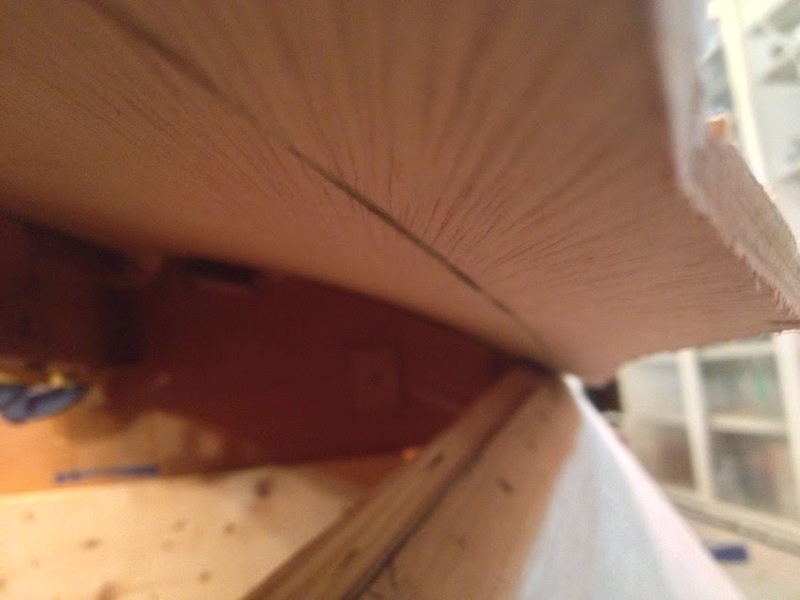 Using a 4-foot ruler as a straight edge, I drew reference lines on the plywood to show placement of the floor battens. That made it much easier to mark the places to drill holes & drive screws. Marking the chines for screw placement has not been so easy. I’ve had to cut away enough overhanging material so that I can use my marking gauge — the same spring clip & duct tape arrangement I used on the side planking. I used the Porter Cable multi-tool saw to cut away plywood as I worked my way forward... cutting new plywood washers as I went. Bottom panel, before much extraneous material was removed. Looking forward, you can see the panel begin to curve and twist. Reference lines for the battens helped greatly with screw placement. 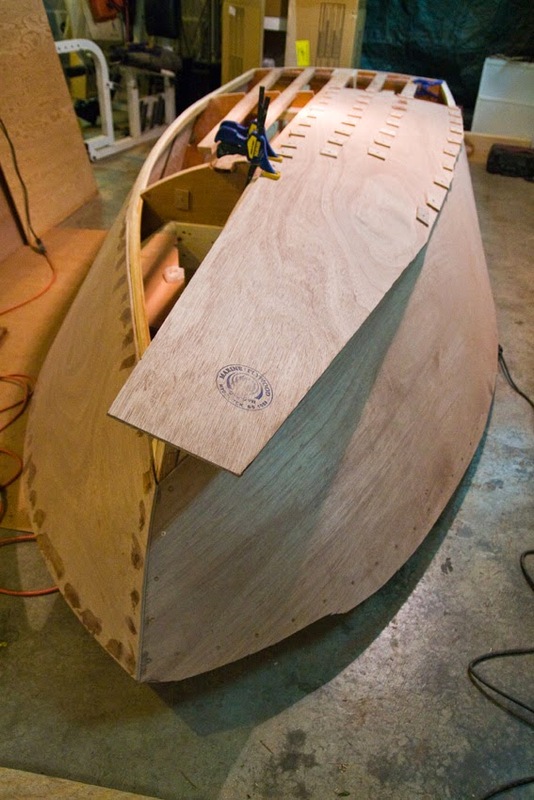 Near the forward frame, the plywood begins to curve and twist considerably. At times, it seemed like I just couldn’t bend it any more without breaking it. 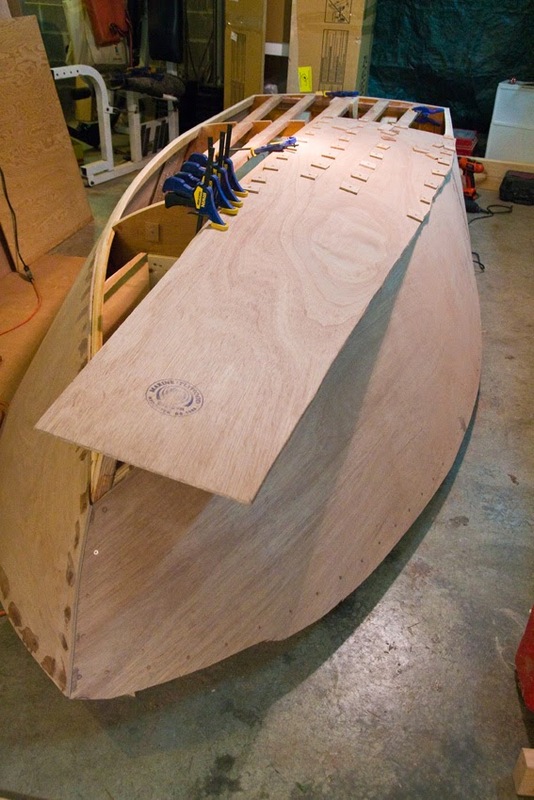 I followed the technique outlined in Boatbuilding With Plywood, and cut away as much extraneous material as I could, while still leaving myself adequate material to work with. 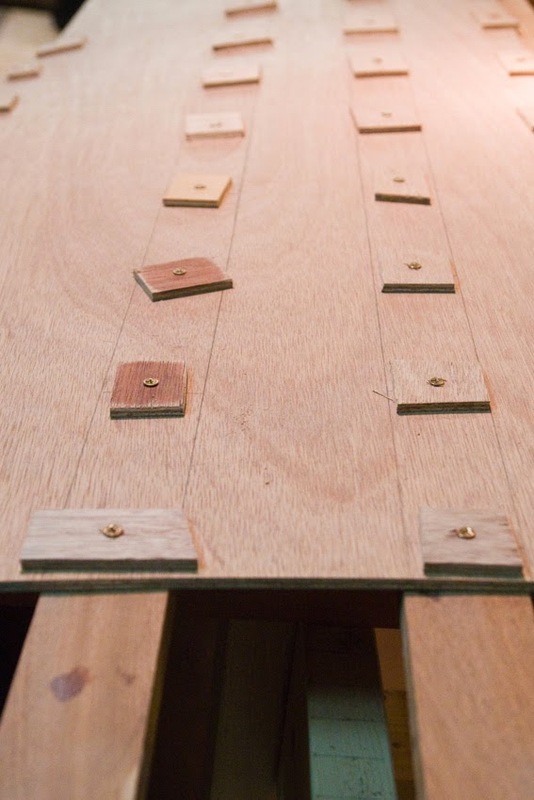 It is amazing how much easier plywood will bend when excess material is cut away. Here, a good bit of material has been removed from the panel. It became much easier to bend. For now, my progress has stopped at the forward frame. I’m just inches away from the transition joint. To mark the approximate cut line up forward, I coated the corner of the side planking with a lumber crayon & bumped the bottom planking panel against it to transfer the mark. It worked reasonably well. Soon, I’ll remove the bottom panel, cut near this line, and re-attach the panel for further fitting. The transferred line on the inside of the panel should help greatly when I remove the panel & trim it down further. Once this panel is cut to shape, I’ll be able to use it as a template for the other panel. Looking great Mike. The marking gauge you used on the sides will also work on the bottom is you use the same basic design, only longer. When using the first bottom skin as a pattern for the second bottom skin, be sure to leave extra material on the second skin until you've verified it will fit the same way. I'm a few months away from this point but I'm starting to think about the task now that I've got both chines in place. Sheers should go fairly quick and then there's the fairing!